Alan Hausenflock delved into digital photography in 2001, after being inspired by the work of Galen Rowell. Alan’s background in information technology, along with his passion for the medium, proved to be the perfect mix. 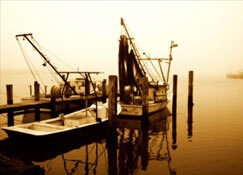 His exquisite scenery shots capture the beauty of his home on the East Coast. As Gango Editions has expanded its photography and custom printing options, Hausenflock’s pieces have taken off – proving him to be one of our most popular photographers. The following interview will explore the photographer’s inspiration and method. Q. How did you get started as a professional photographer? A: I was in a doctor’s office in 2000 and picked up a magazine and discovered a photo of the Owens Valley by Galen Rowell. (shown at right) I was mesmerized by it. My wife bought me a Kodak camera and I was off and running. After a few years of posting work on the internet, Robbin Allen of Gango Editions emailed me in April 2006 and asked if I’d be interested in being represented by Gango. I felt very fortunate. Then in August 2006, Nicole Chavez was assigned as my working contact at Gango. Since then my relationship with Gango Editions has matured into something that is hard working, creative, and beneficial to us both. Q. Tell us about a pivotal time in your career. A. A pivotal time for me was in 2007 when the economy went south and my business did too. I had to decide if I was going to continue or not. I was also in a creative slump and I wasn’t satisfied with my work. It took almost a year, and in the process of deciding what to do I experimented with many different approaches to photography. I managed to find ways to give the final photographic image a more artistic look which was more in line with what I wanted. I think my new direction is also more in tune with the home décor market. Nicole’s guidance was also a big help, so in the end I stuck with it. Q: As one of our best selling artists, your work attracts a broad range of customers. What do you think is the appeal of your artwork? A: Nature has always appealed to me. Art has always appealed to me. Although I’ve never had the talent to be a painter, when I shoot an image it’s with an artist’s eye and a technical mind. When I look at a scene, I see the artistic composition but I also look for potential in terms of what can be done with the image. I never thought of this before but I’m told that my images are masculine in nature. I do like color and contrast, old Hollywood black and white, infrared and sepia, all of which have a broad appeal. I also live on the East Coast so I’m close to the beaches and bays, the fishing boats, the hard work and romance of the sea. The Blue Ridge and the Shenandoah Valley are just a few hours west, and rolling hills and farms are between the mountains and the sea. Savannah is to the south and Pennsylvania is north. I think this kind of imagery appeals to many people. Q. How do the seasons affect your work? A. I find that every season is special it its own way and I shoot all year. Summer is the most challenging in terms of landscape. In Virginia I call summer “The big green blah”. But then there’s the beach and sailing, and quaint little towns along the shore. You just have to drive farther for those places. Q. How do you keep the creativity flowing? How do you bring your skill, inspiration, and work together? A. I find that shooting something new will spur creativity. I also try to stretch past my comfort zone in subject matter, and that can sometimes have the same effect, and sometimes not. Other times I’ll go back to a previous shoot or even to finished work and try something I’ve just learned. Like anyone else, I get in a rut like “if I shoot one more tree, I’ll burn my camera”. The drive is there but I’ve got nowhere to go. 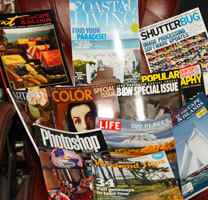 When these dry spells occur I’ll start looking at all kinds of magazine imagery, new software, videos etc. Invariably I’ll get new ideas and new paths to follow. Feedback is very important to any photographer/artist, positive or negative. For me it’s like putting gas in my image car. The car is my technical skill with cameras, software etc. With a full tank I can drive the car wherever I have the inspiration to go. When I get to where I want to be, the work I produce generates more feedback by family and friends, and of course Gango. Feedback equals more (or sometimes less) gas for my image car and I hit the road again. Q. Has your work ever frustrated or surprised you? What are some challenges you face in making art and how do you overcome them? A. Oh yes, many images have both surprised and frustrated me. Between camera exposure, environmental conditions and post processing I can only be about 70% sure of how an image will eventually turn out. In my mind, what will make the biggest difference in an image are its subtleties of light, color and contrast. A challenge for me is to live with a finished image for a time. Invariably, I’ll make small changes in things I hadn’t noticed before and in the end I’ll have a better image. I want the customer to look at the finished image, and want to be there. I have to be mindful of appealing to the many different tastes and preferences of the general public and I try to have a broad subject matter. I also take queues from Nicole about what she would like to see more of such as black and white. I recently started a B&W project on neighborhood eateries and storefronts in Richmond’s Historic Fan District. 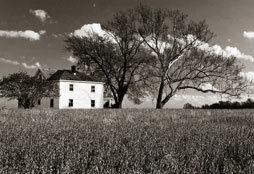 I’ve also had an ongoing B&W project of colonial life in Williamsburg, Virginia. I keep track of what images sell and I try to gage trends but it’s very subjective. Q. What are your plans for the upcoming year? What’s your next step? A. Just to see if I could, I’ve always wanted to create just the opposite of the imagery I usually do. Light, low contrast almost dreamy work. I also feel strongly about the need to find different shooting environments. I’m going to Miami in May and I hope to go out west in 2012. I want to go back to Glacier and Yellowstone National Parks, New England and perhaps Oregon. Places I’ve been before but without a camera. In terms of a next step, I would love to do photography projects for someone where I could travel and see different places. Perhaps with more recognition by the public and with Gango Editions continued support, I might just get there. Other than project work, I’m content to keep learning and creating, and having fun doing it!